Lately I have had a BIG thing for printed blazers. My eye keeps getting drawn to them and I just want to add more and more to my closet. I have been trying to incorporate more blazers into my everyday wear and rather than go with my staple black blazer (here‘s the one I wear all the time but in black) I want to spice things up with a bold print. 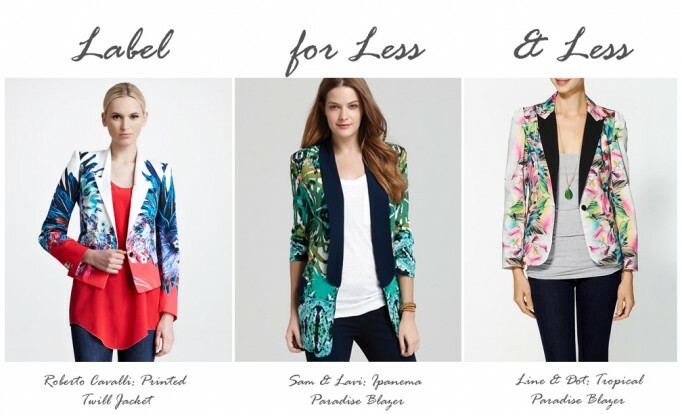 So for this weeks installment of Label for Less I want to focus our attention to the tropical print. This Roberto Cavalli blazer (Label) is just so amazing! The white lapels makes the print stand out so much. I could see this working in so many ways, casual day/weekend wear, at the office, or a date night with the husband. What’s great about the Sam & Lavi version (For Less) is that the shawl lapel softens the overall look. It too can be versatile depending on what you pair it with. Since the jacket is longer in length I could easily see myself throwing this on with skinny jeans, a basic tee, and flats to run errands and know I look super stylish with not much effort. The Line & Dot blazer is a nice mix of between the other two shown. It provides a little more structure than the Sam & Lavi blazer but still not as form fitting as the Roberto Cavalli; who doesn’t love a boyfriend blazer, right?! It also has every color in the rainbow so you can easily find something to go with it. Overall I’d have to say I’m in love with all three. Of course, I can’t buy them all so it comes down to what style will last long past the trend is over for the season. What do you think, is the Roberto Cavalli worth the investment or would you go with one of the other two choices? Label: Roberto Cavalli, retails $1,565, available here. For Less: Sam & Lavi, retails $295 but on sale for $165.20, available here. & Less: Line & Dot, retails $98 but on sale for $78.99, available here.